The staff at Diamond K Eye Care is trained and equipped with state of the art technology to treat eye diseases, provided urgent care, and diagnose and monitor eye conditions including pink eye, ocular allergies, dry eye, macular degeneration, glaucoma, diabetic retinopathy, near sightedness, far sightedness, astigmatism, and cataracts. We offer Optomap retinal imaging to enhance the eye evaluation as a way to map the retinal structuring which assists in the early detection of ocular disease. Whether you opt to wear designer eyeglasses or modern contact lens technology, we will assist in making selections that meet your needs and your lifestyle. If you are interested in LASIK, we will help you decide if it is right for you by providing a pre-operative evaluation and post-operative care if the procedure is performed. Regular eye exams are recommended every year, and more often depending on your age and the findings discovered during your comprehensive eye exam. A comprehensive eye exam takes about one hour and there isn’t and pain involved. First we collect a comprehensive personal medical history, ocular history, and family medical history. Then there are tests performed to measure vision acuteness and your peripheral vision. 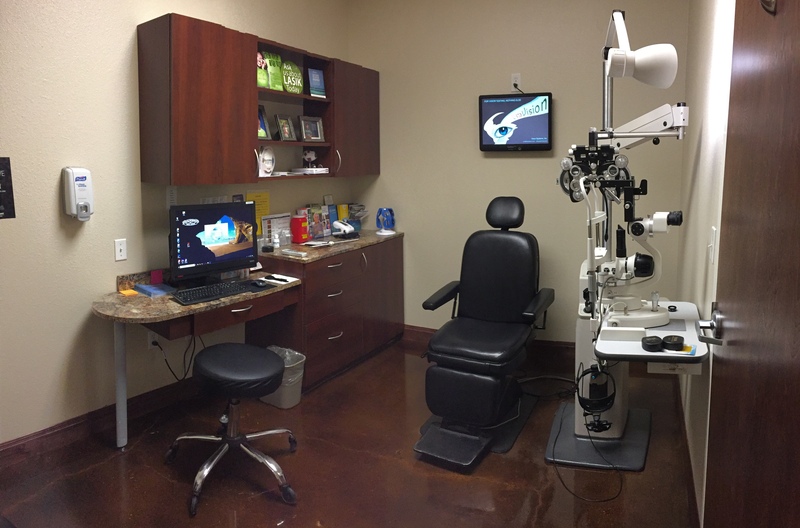 We inspect the pupils, eye muscles for mobility, refraction (glasses prescription), eye lids and lashes, a corneal health evaluation, and retinal health evaluation. All relevant findings will be discussed with you and a treatment plan will be discussed with the doctor. Any questions you may have will be thoroughly addressed. A contact lens examination is similar to a comprehensive evaluation with a few additional tests to determine if the patient is an adequate contact lens candidate. The same history will be taken as well as additional questions as to how you plan to use your contact lenses. In addition to determining your prescription for glasses we will take some measurements of the curvature of your corneas to determine which lenses will fit the eyes appropriately. New patients to our office that may already be wearing contact lenses as well as new patients to contact lens wear will be dispensed a diagnostic pair of contact lenses. These lenses are intended to be tried for approximately one week so the patient can determine if the prescription and comfort of the lenses do well in their daily environment. At the follow up visit, patients will be asked several questions about their contact lens wearing experience. Any changes to the lenses will be determined at the follow up visit. Once the final parameters of the contact lens prescription are determined the patient will be issued a final contact lens prescription. The proper wearing time and replacement rate will be reviewed with the doctor in order to ensure optimum corneal health. There are multiple options for contact lens wearers with todays technology. There are lenses that correct nearsightedness, farsightedness, astigmatism and even bifocal contact lenses. In most cases patients will be able to wear soft contact lenses to correct these visual problems, however under certain situations a rigid gas permeable lens may be necessary. The doctor will discuss this in more detail based on your individual case. If you are having an eye problem that needs immediate attention, please give us a call right away. We offer emergency same day appointments. Symptoms that may require emergency care include: sudden loss of vision, sudden double vision, sudden red/painful, light sensitive eye, pink eye, new onset flashes and/or floaters, foreign body in the eye (especially metal or chemicals). Dr. Klufas and the team at Diamond K Eye Care are proud to offer LASIK evaluations and post-op care at our office. If you’ve been considering LASIK surgery to correct your vision but aren’t sure if you’re a viable candidate, schedule an evaluation at our office to see if a potentially life-changing procedure is right for you! Our goal is to have each patient leave satisfied knowing that they are receiving the best eye care products and services possible.